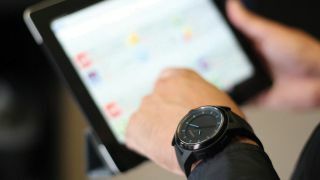 There will be 101.7 million smartwatches in use by 2019, according to a new report by Juniper Research. The average smartwatch will cost at least $200 (£120, AU$210) until at least 2020, the report projects. Only 0.26% of smartphone users worldwide own a smartwatch. More than 21% of smartwatch owners live in the US. Juniper Research expects the market to accelerate in the next 12-18 months, as brands outside of the tech sector, such as TAG Heuer, create their own devices. Additionally, features like GPS and NFC will become standard in the next few years. However, Juniper doesn't expect a single "killer app" to define the category or to separate one of the major vendors from the rest of the pack. The smartwatch category is led by the Pebble Steel. The watch, which features a stainless steel frame and 1.26-inch LCD face, will run you $199 (£179, about AU$228). The Moto 360 is also a safe bet for smartwatch enthusiasts. It features a 1.65-inch circular display, stainless steel frame and premium leather band. However, the device is Android-only, so iPhone users should look elsewhere.